Welcome to the South Pacific Bible College, Lynbrook Campus web page. The Bible School meets the student’s desire to learn more of the truths of God’s Word as they seek out the Lord’s direction and purpose for their lives. The Bible College at Lynbrook is under the national Bible College called The South Pacific Bible College. The South Pacific Bible College was an on campus institution until 1990 when the video Bible teaching programme was introduced. A network of campuses was established offering the video courses available today. Currently there are over twenty campuses participating in the programme. 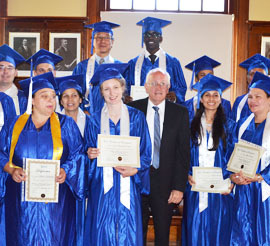 The Bible College has been developed as an arm of the United Pentecostal Church of Australia to assist Bible students, not only in the context of learning to pass exams, but to establish better personal relationships with the Lord, a better knowledge of His Word and to establish good study principles and a disciplined Christian life. Bible School is a step in growing to maturity. Our desire is that the students build up their faith in, and knowledge of, the Lord, Jesus Christ. Our desire is for them to be established in the kingdom of God and that they would become labourers that are well equipped to win and minister to hungry souls. 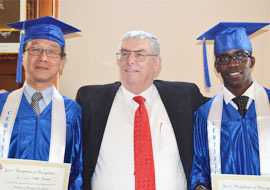 The South Pacific Bible College offers a two year “Certificate of Evangelism” course. This is a video programme. The Lynbrook Bible College has classes every Tuesday evening. The aim of the college is to train ministers, evangelists, missionaries, Sunday school teachers and lay workers to be better equipped in their fields of labour. The college strives for extensive knowledge of the Bible, with special emphasis on knowledge of Pentecostal doctrine.